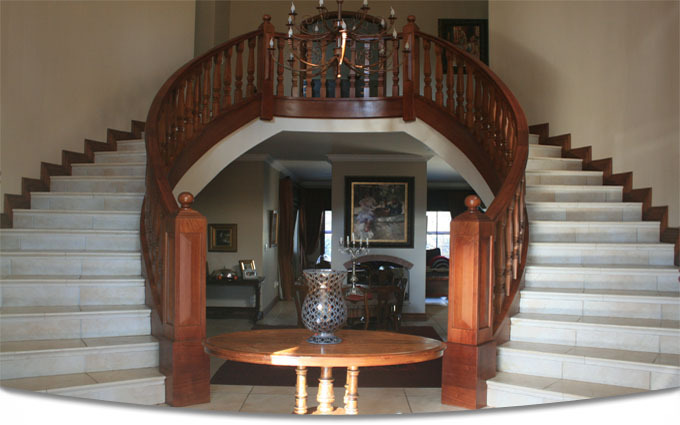 Frans, the owner and master craftsman of “Upstairs” by Mooiplaats Design cc, has been in business for more than 20 years. 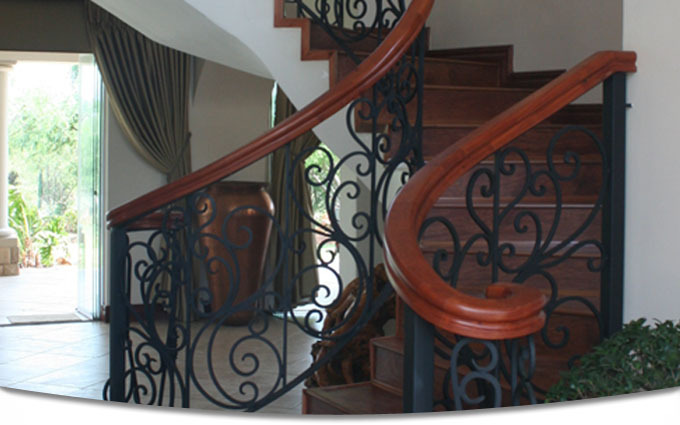 For more than the past ten years he has specifically focused on the manufacturing of bespoke stairs and balustrades, and his work graces many beautiful and famous homes. Each project is handcrafted by him and personally installed. He works closely with clients, architects, interior decorators and builders to ensure that the end result is an asset to the finished building and meets the client’s expectations. Being involved from inception of the project to completion, creates the best opportunity to ensure a masterpiece that will last for years to come. Work is mostly done in sustainable sources of exotic hardwoods, but also in African mahogany, Rhodesian teak and other indigenous woods. Styles of work vary from the classical, contemporary to the ultra modern. Wood is also combined with steel, stainless steel and glass. Some intricate and very different works has been completed successfully. 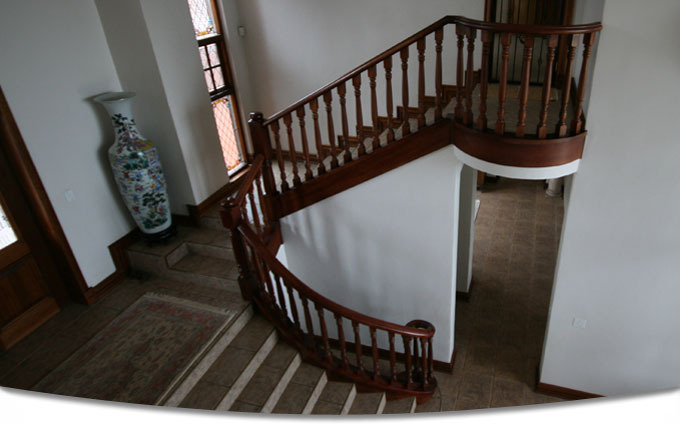 From complete hanging staircases, to wooden steps, full balustrades to handrails – if it is upstairs, he is the craftsman to commission. Finishes ranges from hand finished, stained & sealed, white painted, paint techniques and just sanded, the skill of airbrushed sealer or paint is mastered and a trademark of the work from “Upstairs”. 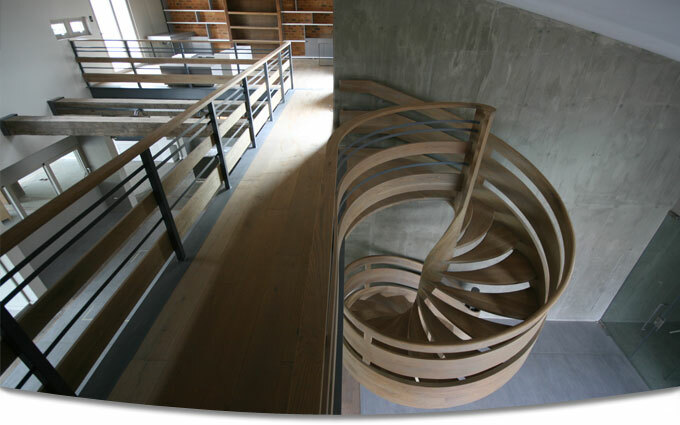 Truly bespoke work with specially crafted wood panels for balustrades and funky designs with steel and wood has been produced. Fabulous ultra modern creations of glass, steel and wood has been installed in famous homes. 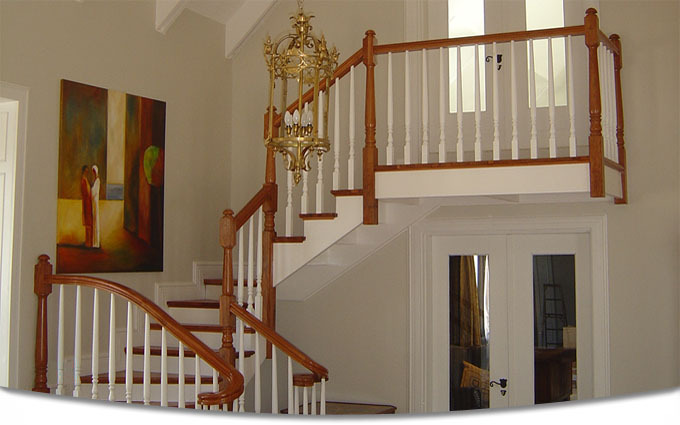 If you really want your stairs and balustrades to be the conversation point, then “Upstairs” is the company to contact. 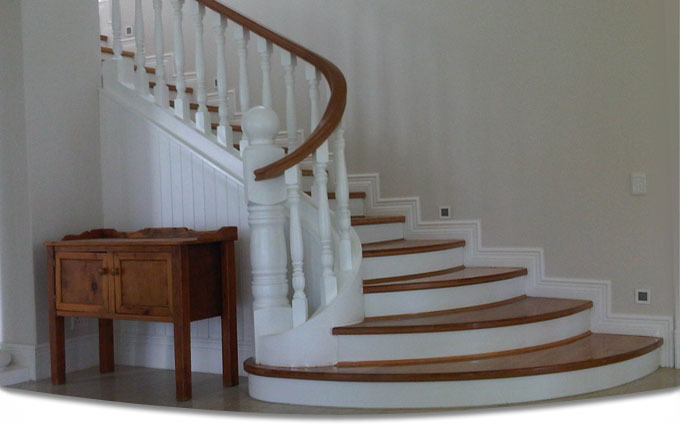 But if you just want a simple flight of pine stairs, we can also manufacture and install. Many a beautiful fireplace surround, wood panelling, architraves and other wood finishes has also come from our specialist workshop. After client consultation and measuring, most of the manufacturing is done off site in our large and well equipped workshop, where the work is completed and finished, ready for installation. This work method ensures that the minimum disruption is created on the site, near completion time of the project. The completed work is carefully transported to site, wrapped in bubble wrap and blankets to ensure no damage is done and then installed on site with minimum time and disruption. Small adjustments and finished might be needed on site. 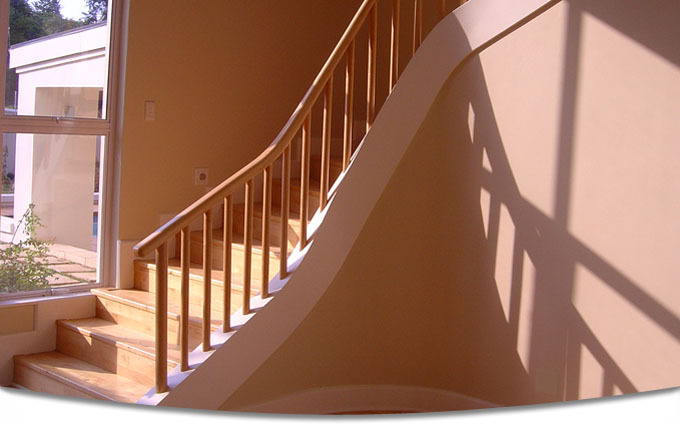 It is important that the “Upstairs” consultation takes place earlier on in the project to ensure that the best possible solution and product is chosen, but equally important that the work be done as late as possible in the project life cycle, to ensure that the high quality finishes is not damaged by other contractors still on site. A long list of many satisfied clients from past projects can be provided. Over the years numerous clients has had Frans do more than one project in their different homes. Browse through the many categories, finishes and examples of work done in the past to get an idea of the kind of work produced. Hundreds more photos also available – too many for the website but available in consultation.